In sessions for schools on Compost Creatures and Compost Safaris, we concentrate on the larger creatures involved in composting, as well as those others that will find their way into the heap. In the text below we list the creatures in reverse order starting with the largest creatures and working down to those that can be seen only with a microescope. These larger creatures, sometimes known as Macro-organisms, physically break down the organic material by chewing, tearing and, in some cases, sucking it into smaller pieces. Ants, beetles, centipedes, “composting” worms, flies, millipedes, slugs, snails, spiders, and. woodlice (sow bugs) are all in this group and can be easily seen by the naked eye. These creatures make up the third level of decomposers who work to produce compost. The second level decomposers e.g. springtails, nematodes, beetle mites, mold mites and protozoa, eat the organic matter and the organisms that make up the first level decomposers. These tend to be smaller and the use of a hand lens or stereoscopic microscope is useful to observe them in detail. The first level decomposers are the much smaller Microorganisms and they play the major role in the composting process. They use the organic matter in the compost bin or heap as a source of food resulting in its decomposition to the rich brown material we know as compost. We can speed up the natural decomposition process by providing optimum conditions for the soil microorganisms to breakdown more quickly than would occur without our intervention. Many of these bacteria, fungi, and actinomycetes break down the organic material chemically, in contrast to the physical action of the macroorganisms. The actual species of composting microorganism in any given heap will vary, depending on the climate, moisture content, pH Compost pH, temperature and the conditions within the particular part of the heap at the time of collecting the samples for identification and counting. These bacteria, actinomycetes and fungi will be present in massive numbers. The “On-Farm Composting Handbook” gives examples of the numbers of each group of microorganisms present. Bacteria 1,000,000 – 1 billion present per gram of compost. Actinomycetes 100,000 -100 million in a gram of compost. Fungi 10,000 -1,000,000, fungal cells per gram of compost. Contaminants from other sources, such as animal and human faeces. These will soil, water and contaminate microorganisms will include those that are pathogenic to humans. Bacteria are small single celled organisms and are the largest group of microorganism involved in the composting process with between 1,000,000 – 1 billion present per gram of compost. The majority of bacteria are spherical (Cocci) or rod shaped (Bacilli). A data microscope, stereoscopic or general laboratory microscope will enable you to see a number of these. Bacteria are the dominant population of microorganism during all stages of the composting process and are particularly active in the breaking down of the easily degraded organic material whereas the actinomycetes and fungi typically proliferate in the later stages. Bacteria require carbon (Browns) and nitrogen (Greens), using carbon as a source of protein and nitrogen as their main source of energy. The Actinomycetes are actually bacteria but in most publications are discussed separately as they play a major role in the decomposition the less easily degraded than that favoured by other bacteria. Actinomycetes can also tolerate dryer conditions than other bacteria and produce a chemical (geosmin) responsible for the typical musty, earthy smell of compost. They are normally found in compost 5-7 days after the start of the process. The Mesophilic actinomycetes operate best in medium temperature areas (20º–50ºC) of the compost normally the edges of the heap or bin and at the end of the process. Thermophilic Actinomyces grow at between 30º–60°C. The optimum temperature for thermophilic fungi is 40–50°C which is also the optimum temperature for lignin degradation in compost. Like fungi, Actinomycetes form threads, filaments, or strands, which spread throughout a compost heap or soil. After bacteria, Actinomycetes are the second most abundant microorganism in the compost heap. There are typically 100,000 -100 million in a gram of compost. They do not respond well to acidic conditions (below pH 5.5) or in the presence of a high moisture conditions. Fungi also form threadlike filaments know as hyphae, which spread through the compost heap or bin. Fungi play an essential role, as they are able to breakdown the more resistant organic material e.g. cellulose and lignin. Fungal hyphae aid the aeration and drainage of the compost pile by physically aggregating into small particles. There are between 10,000 -1,000,000, fungal cells per gram of compost. Most fungi cannot survive thermophilic stage of hot composting as they do not grow above 50°C and although there are some heat tolerant thermophilic fungi, indeed some start to grow at 60°C e.g. Chaetomium thermophile, some Humicola species Thermoascus aurantiacus and have a role in decomposing cellolose and hemicelloloses. Aspergillus fumigatus can also be active at these temperatures and will continue to function when the compost is reoccupied by mesophilic organisms. Microorganisms can be divided into those that respire aerobically, using the oxygen present in the air for energy metabolism, and anaerobic bacteria that do not use oxygen for energy metabolism. In home and garden composting, we make use of aerobic bacteria to produce compost from the organic waste this requires the presence of air, moisture and produce heat. Systems such as the Bokashi bin involves Anaerobic decomposition as a result of sealing the material in a container without air the material in a Bosashi bins does not produce heat. A similar situation can occur if food waste is stored in a kitchen caddy or bin, for more than a week or so it starts to turn soft, mushy and eventually liquid making it unpleasant to handle. Aerobic bacteria are the most important to the process of converting organic waste to compost. They are necessary for the conversion of the organic material into the moist, rich compost we are attempting to produce. These aerobic bacteria require oxygen levels of more than 5% to oxidize carbon to provide them with energy. This oxidation process produces the heat that raises the temperature of the compost heap, or bin, during the early stages of the composting process. As described, in the section on hot composting, under the right conditions the compost will heat up within a day or two to 60C or higher, due to the aerobic bacteria consuming readily decomposable material. In addition to carbon. Nitrogen is also necessary to the composting process enabling the bacteria to form the protein necessary for them to grow and reproduce. Hence the importance of the C: N ratio. Where there is insufficient oxygen present to support the growth of aerobic microorganisms i.e. under anaerobic conditions, anaerobic bacteria will ferment the organic material. Unfortunately, for the composter, the anaerobic process results in the production of organic acids and amines, producing the easily recognizable smell of ammonia, as well as hydrogen sulfide (rotten eggs smell). The organic material is turned into a wet, smelly black mess. In practice, if this happens it is because we have the C: N ratio wrong. We can try to rectify the situation by adding additional carbon rich (Brown) material and turning the compost to open the mix to create conditions under which aerobic bacteria can function. The requirement for a moist mix during the composting process, 50% - 60 % moisture content, is because the Compost microorganisms live in the water films surrounding the particles of organic matter. There are a wide range of bacteria that occur naturally in the soils and will be present in compost. The table contains brief notes on the habitats in which they are normally found. Bacillus species can be obligate aerobes (oxygen reliant), or facultative anaerobes (having the ability to be aerobic or anaerobic respiration). Found in plants and animals. In cattle and horses etc digestive system it breaks down the cellulose of grass. Found in soil, faeces, meat, sewage and thermal springs. Decomposers digesting tough plant tissues like the cellulose and lignin in bark, paper and stems and the chitin or hard exoskeletons of insects as part of the composting process. Found in soil and decaying organic matter, i.e. compost, bird droppings, tobacco, stored foods.Can grow at temperatures up to 50 °C and survive at 70 °C conditions found in hot composting. nutrients to support their growth. When the microbes flourish, they will raise the heap temperature as a result of their metabolic heat generation during the conversion of composting materials to energy, carbon dioxide, water and compost. During different stages, the temperature of the organic material and its nutrient content will vary and will provide a favourable habitat for different types of microorganisms. Microorganisms can be grouped by the temperatures at which they can live. 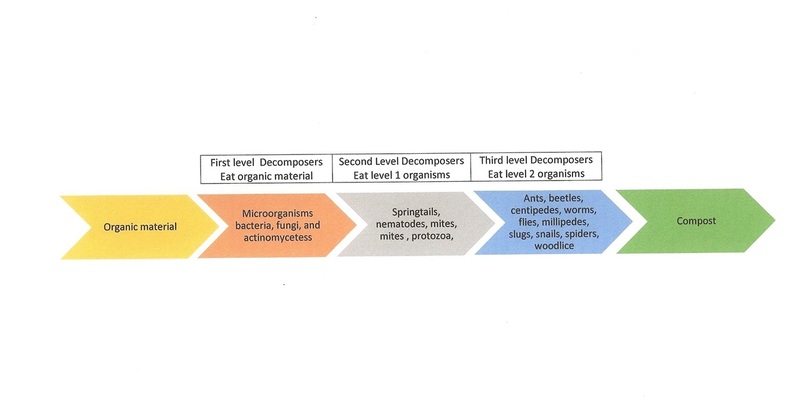 Different authors have classified the Composting stages based on the temperatures created by predominant bacteria groups at any time, simply as the Initial stage, Active stage, Curing and Maturing stages while others have described the stages on the basis of what is happening to the organic material e.g Degradation, Conversion and Maturation (DCM). The Pyschophilic bacterial stage (A resting stage. Not recognized as the first stage of the process by all). The Maturation or Cooling and Curing phases. During the winter, the compost heap may become frozen and even on warmer days, the temperature may not rise above 13ºC. Psychrophilic microorganisms function at low temperatures from -10º to 18ºC or 20ºC (14 – 68ºF) but below about 13ºC most of the microorganisms in the heap will be semi-dormant and there will be little decomposition of the material. At 13º- 21ºC, the psyochophiles become more active. They produce only a small amount of heat compared with other bacteria and can be active during the winter without significantly raising the temperature of the compost in cold weather. As the weather becomes warmer, the heat they produce can be sufficient to increase the temperature of the heap of bin. As the temperature rises, the psychophiles are denatured and a group of organism that function at over 25ºC, the Mesophiles, become important to the process. Using the Degradation, Conversion and Maturation (DCM) Classification the Degradation phase commences at about 12ºC. Many workers consider the Mespohilic phase to be the first phase of real composting. This is a continuation of the Degradation phase under the DCM classification. Mesophiles are found in water and soil. Under favourable conditions, mesophiles can double their numbers in 20-30 minutes; they are responsible for most of the bacterial diseases of humans. This moderate temperature mesophile stage ranges between 20ºC- 40ºC or 45ºC, although many mesophile species thrive best between 21º and 32ºC. The initial mesophilic stage normally lasts for two or three days. During this period the mesophilic organisms break down the soluble, more easily degraded organic compounds producing, in addition to heat, acids and carbon dioxide. As the temperature rises Thermophilic organism begin to dominate. In a cold composting “add as you go” systems, where organic material is added regularly in small amounts e.g. when using a small compost bin or heap, the compost may never reach a higher temperature as the heat produced by bacterial activity is lost to the environment not allowing the thermophiles to become dominant and requiring the mesophiles to do most of the work. During the Mesophilic and Thermophilic stages of the composting process, actinomycetes and fungi are confined to the outer 2 to 6 inches of the heap of bin. Some molds also grow in this outer zone of the composting galaxy. Unless the compost is aerated by turning frequently fungi and actinomycetes, hyphae can give grayish white appearance to this outer zone. Frequent aeration where the cooler material in the outer areas is turned into the centre of the heap prevents the formation of sufficient hyphae to produce a colour change of be visible to the naked eye. The activity of the Mespohiles results in the production of heat and a significant increase in the temperature of the heap to that which favours thermophilic organisms (40°C to 70°C). These are the most efficient decomposing bacteria in a hot composting pile and continue the Degradation Phase under the DGM classification. These organisms start to dominate the heap at temperatures of about 40ºC in batch composting. Composting proceeds at a much faster rate under thermophilic conditions. It is during this stage that most of the organic matter is converted into carbon dioxide and humus. There is also a growth in the number of microorganisms present. These high temperatures accelerate the breakdown of cellulose, hemicellulose and other complex carbohydrates, proteins and fats. The thermophilic population continues generating more heat by decomposing the remaining organic matter. As this food source is used, the activity of the thermophilic microbes declines, unless the heap is regularly fed new material and turned to aerate it and move materials from the cool sides to the centre, and the compost temperature falls after three to twelve days (depending on the compost technique used). This allows the return of Mesophilic organisms once again become the dominate group of bacteria in the compost heap. During this period, the Conversion phase beings. In a compost bin or heap this conversion will occur at the bottom as the organic material starts to take on the appearance of compost. As mentioned above the period of thermophilic activity can be extended turning/mixing the heap and aeration. The stages are easily monitored in batch composting as the temperature changes can be made to apply to the whole heap provided it is turned regularly. If the material is not turned the area at which the high temperature occurs may only only to within 4 to 8 inches of the surface. In hot composting using a heap, the temperature can be monitored and the heap turned, outside to the centre, as it starts to cool so as to hold the material at a sufficiently high temperature (see the page on Compost Temperatures). Where a tumbler bin is being used this mixing and aeration occurs daily when the tumbler is turned. Hot composting at temperatures 55°-60° C and over will destroy the majority of plant and human pathogens and weed seeds present. There are mixed veiws on the number of times the heap should be turned. A single through turning may be sufficient eliminate the pathogens and parasites but for this to be effective all the outside material most be completely turned to the inside, most hot composters will turn material at least twice with many opting for three or five turnsto be on the" safe side". Alternatively the turning can be undertaken in conjunction with measure the temperature of the heap and continuing turning the material until there is no marked change in temperature following the aeration. The killing of pathogens is an advantage offered by the hot composting techniques but it is not necessary unless there is a specific concern about killing disease organisms and seeds. An alternative to killing pathogens is not to add diseased materials that will survive cold composting to the bin in the first place. Chaetomium thermophile, Humicola insolens, Humicola lanuginosus, Thermoascus aurantiacus and Aspergillus fumigatus. Eventually insufficient nutrients will be available to maintain the higher temperatures and the heap will return to the cooler levels of the mesophilic stage, even when turned i.e mixing by turning and turning the compost fails to lead to any increase in the temperature of the compost. In cold composting, while temperatures that favour thermophiles may be reached in particular parts of the heap after new material is added most of the heap will not exceed 40ºC and it is it is mesophiles, not thermophiles, that will do most of the work. Actinomycetes assume a major role during the final stages of decomposition, and may produce antibiotics that inhibit bacterial growth. They work on tough-to-break-down organic materials such as avocado, seeds and glossy leaves. In order to avoid breaking up the hyphae of actinobacteria (and fungi) I would recommend that tumbler composters are not turned during the curing phase and that the compost in conventional heaps, piles or bins are not mixed or aerated. Fungi also play a significant role during the final stages of composting. Fungi are primitive plants that can be either single celled or many celled and filamentous. Fungi are present in smaller in numbers in the compost than actinomycetes or bacteria, but larger in body mass. Their main contribution to a compost pile is to break down cellulose and lignin. They prefer cooler temperatures 22C-24C and easily digested food sources. During this curing and maturation stage of composting the cooler temperatures encourages the entry of worms, insects mites and the other Macroorganisms we find on when undertaking a Compost Safari. These include the food poisoning bacteria that are often featured in the press following a disease outbreak e.g. Salmonella, Campylobacter, Clostridia perfringens, Clostridia tetani, E. coli, Staphylococcus aureus, as well as other pathogens such as Coxiella burnettii (the cause of Q fever), Pasteurella, Listeria, Erysipelothrix, Leptospira, Serpulina hyodysenteriae and mycobacterium. However, Home Composting material from your own kitchen or garden is less likely to be contaminated with animal and faecal waste than materials collected by kerb-side collection or from other sources. (It is not unknown for garden waste bins left for collection to contain disposable nappies!). Luckily most of the pathogenic bacteria will not be present in large enough numbers to cause disease in humans and in the majority of cases; the composting process will kill them if hot composting techniques are used. Bioaerosols (airborne microorganisms including bacteria and fungi spores) are frequently implicated in cases of infection from compost. The number of bioaerosols will be dependent on the degree of contamination of the initial organic material, the growth of the organisms while waiting composting and during the composting process. S. L. Currie, T. K. Beattie, C. W. Knapp and D. S. J. Lindsay examined 24 composts for the presence of Legionella species. More than half of the samples tested positive for Legionella, twelve different species. The most commonly isolated Legionella species was Legionella sainthelensi. Legionella pneumonophila causes Legionaires disease a form of pneumonia normally associated with air conditioning systems and aerosols from showers etc. is also a risk in “standing” water sources between 20C-45C were aerosols are formed. The Tetanus bacteria (Clostridium tetani) is common in compost, soil and manure and it is likely that any gardener will be in contact with it quite frequently. Vaccination is recommended. The fungus Aspergillus fumigates, which causes a group of diseases known as ‘Aspergilloses’, is commonly present in crop plants, decomposing material, and decaying vegetation, including compost heaps with the risk that fungal spores will be inhaled when turning the compost. Not only does it produce numerous spores it is able to survive thermophilic temperatures, which presents an occupational hazards to those working in industrial composting facilities. The risks associated with infection when working with compost are small and a few simple precautions will reduce that risk to a very low level. Moisten compost before aeration and consider wearing a dust mask (particularly if the compost smells musty). Do not hold your head immediately over the compost bin when aerating the compost to avoid directing aerosols or spores into the face. Do not store compost in the greenhouse where it will warm up during the summer allowing microorganisms to multiply.